A beautiful plaster figure of the goddess Isis, shown in a long chiton, a typical style of Greek dress. Circa 1800. The figure places her weight on her right and moves her left slightly back and to the side. 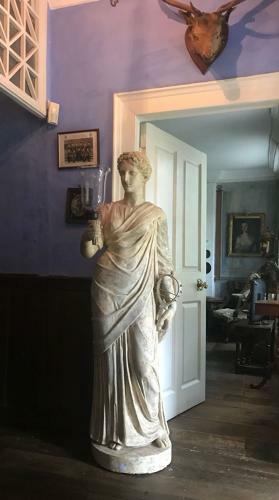 In her left hand she holds a sistrum (a musical instrument) and holds a torch in her right, on top which stands a glass storm shade. Originally an Egyptian goddess, the worship of Isis spread to the Greco-Roman world in the 4th century B.C. after the conquest of Alexander the Great over Egypt.